The 5/21 Umeda Team B show was SKE48’s Ishida Anna’s birthday show and last stage show as an AKB member. Annya blogged about it and the Team B members had a party after the performance. For the second year in a row, AKB ranked top 3 in CD Sales. Yukirin took part in the award ceremony along with Akimoto Yasushi, Takamina, Mayuyu, Kojiharu, Ricchan, Paruru, Annin. 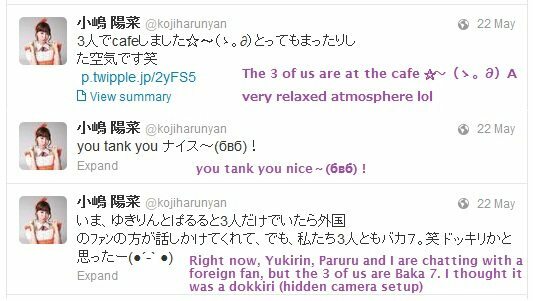 After the JASRAC awards ceremony and before heading to the AKB theatre, Yukirin went to a cafe with Kojiharu and Paruru. 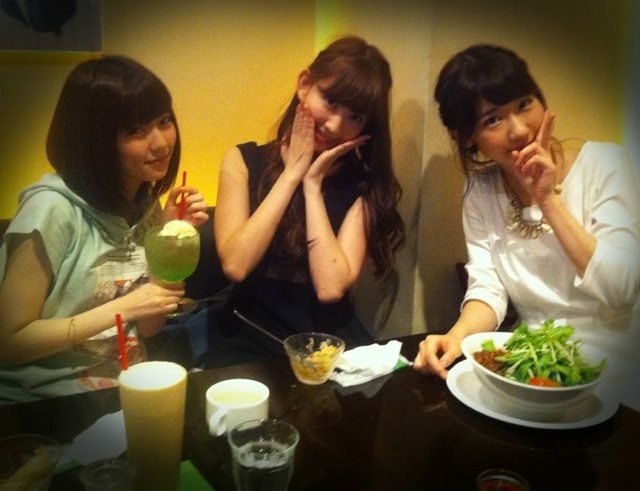 Kojiharu tweeted about it. 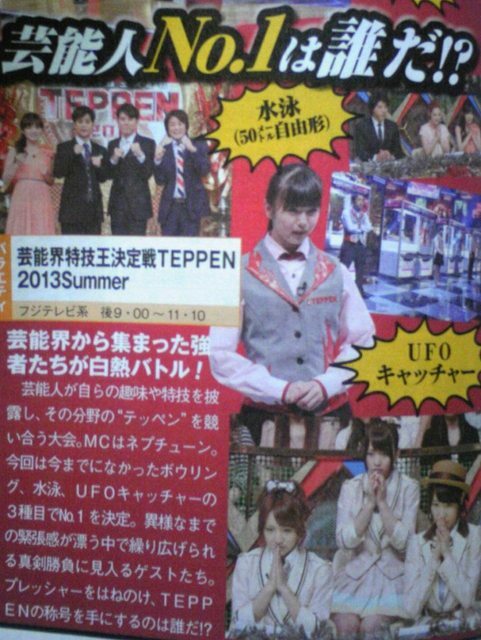 The 5/22 Umeda Team B show was Kojiharu’s birthday show. It also featured the 32nd Single Election Preliminary Results. A talk segment was shown which featured each member talking about a problem and Paruru and Yui helping them solve their problem. Yukirin’s problem is that she would like to get over her my paceness, ie. spending too much time on her makeup. She mentioned she was the last one to enter the studio today. At the end, Yui said, this is just part of who you are, your character so it’s ok. So then Paruru said, since it’s part of your character, there is no problem, so problem is solved! 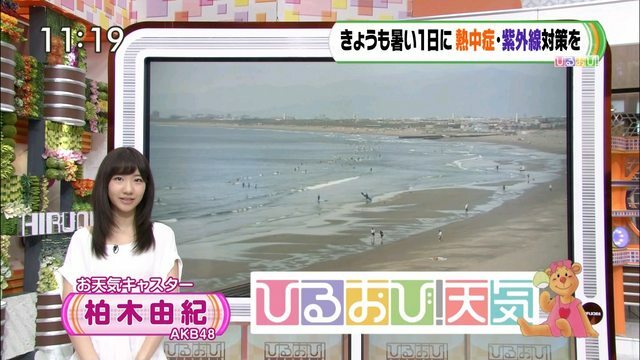 Yukirin did the weather corner Friday morning before heading to Fuji TV studio for rehearsal and live broadcast of Music Station. AKB48 performed Sayonara Crawl on Music Station. It also featured a new outfit for the song. A very a cute wink from Yukirin!!! There will be a talk between all the solo singers including Yukirin as the show features Mocchi and a performance of her debut song. 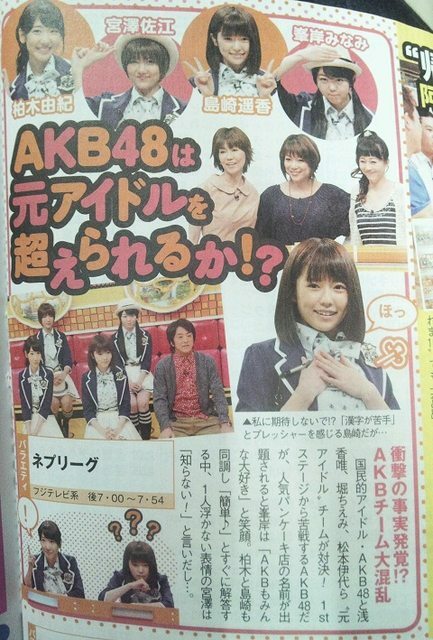 Yukirin will be on Nep Leaque with Sae, Miichan and Paruru. Fans previous thought Yukirin was recording AKBingo on May 11, but it seems she was recording Nep Leaque instead.